“Souls of the Labadie Tract is neither traditional recitation nor music-with-words. But once the red herring of categories is dispatched, the [piece] reveals a confrontation with history, community, language, and sound that is truly harrowing. Pairing Howe’s reading voice with Grubbs’s arrangements for synthesizer and khaen (Laotian mouth organ), the work hinges on the former’s [long poem], a sifting, shifting archaeology of a quietist sect known as the Labadists. … Souls of the Labadie Tract is, first and foremost, a poem about time and loss. … Poetry may be the truest form of history writing if what one wants from history is an image of the present (Ezra Pound called this “news that stays news”). And in Howe’s imagination, the past becomes a very current stake. … Grubbs’s sonic architecture is a striking accompaniment to the text. The rumbling disruptions and deep breath drones that mount and fall around Howe’s speech present him in fine electroacoustic form. Especially suited to the poem and its subject matter is the combination of reeds and machines, which suggests the powerful open textures of a church organ or calliope: an invocation to the collective experience of mystery.” (Artforum International 46.2 (Oct 2007): 135). Poet Susan Howe is the author of numerous books of poems including: Souls of the Labadie Tract, The Midnight, Pierce-Arrow, and Singularities. Musician David Grubbs has made ten solo records, played in a number of groups (Squirrel Bait, Bastro, Gastr del Sol, Red Krayola, Wingdale Community Singers), and frequently collaborates with writers and artists. He is an assistant professor of Radio and Sound Art at Brooklyn College, CUNY, and director of Brooklyn College’s graduate programs in Performance and Interactive Media Arts. 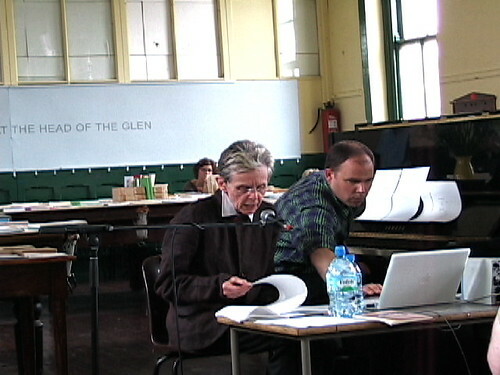 Image: Susan Howe and David Grubbs performing in Cork, Ireland; photograph by Keith Tuma.